With years of experience behind him, Dr. Marvin Friedman specializes in diagnosis and treatment planning, removable prosthetics, and sedation dentistry for Premier Care Dental Group. Patients and fellow dentists have praised the doctor for his ability to provide thorough, consistent evaluations that assure an accurate diagnosis and an effective treatment plan. Dr. Friedman provides “sleep dentistry” which allows patients to have all of their dental needs met without anxiety or fear interfering with the process. 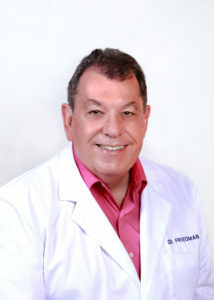 Dr. Friedman earned his D.D.S. degree from the UCLA School of Dentistry in 1975, where he had performed his undergraduate work and later worked as an associate professor in the prosthetics department. Over the years, the doctor earned a strong reputation working as a clinical director and sedation specialist. He is a leader in the sedation dentistry field, with over 2,200 cases completed. An active member of his community, Dr. Friedman is involved in a number of local organizations and prides himself on a strong commitment to community service. In his spare time, Dr. Friedman enjoys painting as well as family activities.